Obviously, you don’t have to be a man to Travel With Balls. TWB has nothing to do with gender — it’s about traveling with the spirit of adventure and a bit of daring. One individual who definitely exemplifies the TWB ethos is Rita Golden Gelman. Rita was 48 years old and going through a divorce when she decided to dump all of her possessions, give up her home in the tony neighborhood of Brentwood, California and start traveling around the world. She’s been on the road ever since —Gelman is now in her sixties and still going strong! Rita’s one of my role models. I read her memoir, Tales of a Female Nomad (originally published by Crown in 2001 but now available in paperback from Random House) several years ago and have been dreaming about doing something similar ever since — albeit with my beloved soul mate at my side. For now it remains just a dream — we don’t have the financial wherewithal to keep our condo without continuing to work and, as a Cancer for whom home and hearth are important, I can’t conceive of not having a home base to return to from time to time….Guess my cojones aren’t quite as big as Gelman’s! 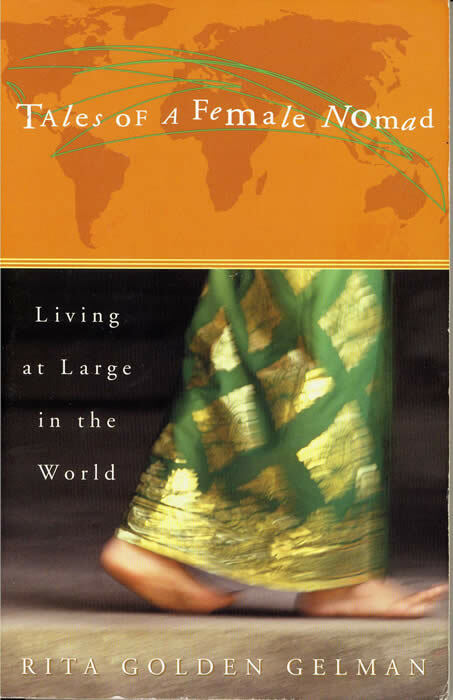 Even if you can’t (or don’t desire to) heave your whole familiar life away in order to hit the road for years at a time, Tales of a Female Nomad is still an entertaining and inspiring read. Hopefully, it will encourage you to live at least some of your dreams. To find out more about the book, or to learn more about Gelman herself (she writes a very good blog…) go to http://www.ritagoldengelman.com.